Some historic figures leave giant footprints. Others cast a looming shadow. But when it comes to portraying Winston Churchill on film, it really comes down to his famous silhouette: the almost snowman-shaped figure in a three-piece suit, chin jutting over a short but corpulent body, topped by a homburg hat—and always with a cigar (of a size that came to be synonymous with his name) clenched firmly between his bulldog-like jaws. When you take on the role of Winston Churchill in a film, as Gary Oldman did in his Oscar-winning turn in 2017’s Darkest Hour, the question for the actor is always the same: Can you fill out the silhouette? And can you mount the role, undaunted by the fact that a number of acting greats have already taken a crack at this character, often hailed as the greatest Englishman of all? It took Oldman the better part of a year to decide to play Churchill in Darkest Hour, and almost another year to do the research and makeup tests, before shooting the actual film. Already considered one of the greatest actors of his generation, Oldman earned a Golden Globe and a gaggle of critics’ awards as the best actor of 2017, in addition to his Academy Award. 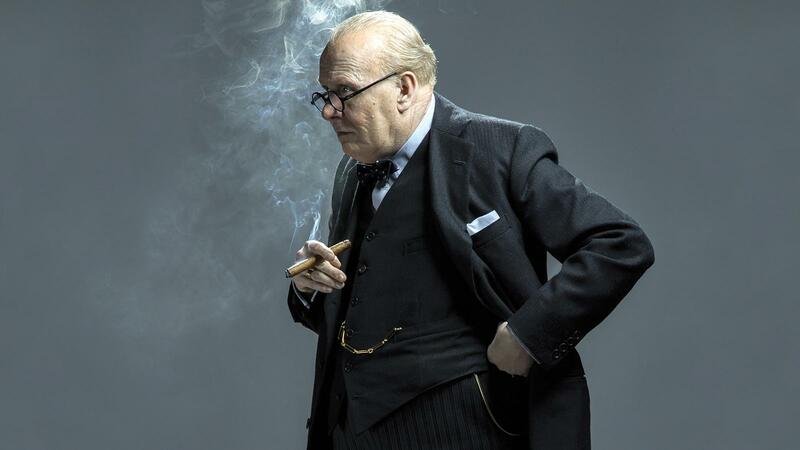 It was director Joe Wright who convinced Oldman to take a crack at Churchill, telling him that if Oldman could find and embody Churchill’s spirit, the rest would take care of itself. “When casting, you can either choose someone who looks right or someone who has the essence of the character. And I always think it’s wiser to choose the latter,” Wright told The Atlantic. Oldman, however, insisted on the real deal. Various reports say the actor smoked anywhere from $10,000 to $30,000 in Cuban cigars over the course of filming Darkest Hour. Appearing on “The Graham Norton Show,” Oldman claimed he’d smoked a dozen cigars a day for the entire 48 days of shooting. He said they cost $50 apiece. According to Focus Features, the film’s distributor, Oldman smoked Cohiba Siglos on the set. The Cohiba Siglo V is the longest Siglo (it’s 6 3/4 inches long by 43 ring) and British shops sell them for £38.80 each, including taxes, or $55 at current exchange rates. Twelve cigars a day for 48 days is 576 cigars, and at $55 each that amounts to more than $31,000. The very first image of Oldman in Darkest Hour includes a cigar, which is seen as Churchill has his breakfast served to him in bed in May 1940, shortly before he is to be named prime minister. Even before his servant can pull the curtain to let in the light of a new day, Oldman’s Churchill illuminates the darkness of his chamber with a wooden match, firing up a cigar in a billow of smoke, beginning dictation to his secretary practically before he’s finished exhaling. He seems to smoke everywhere protocol (or chutzpah) will allow: in the car, on the toilet—even in the London Underground, where fellow riders in a subway car are surprised by his presence when he asks for a match. Only when he is speaking within the halls of Parliament itself does he seem to forgo the impulse to indulge in fine tobacco. By his own estimate, Oldman spent a record amount of time both putting on and wearing the character makeup during the 48 days of filming. He faced days of up to 17 hours, starting with four hours in the makeup chair as he was transformed into Churchill. The filming was 10 to 12 hours, and after shooting all day, he had to spend another hour having the makeup carefully removed, to be used again the next day. No matter how major or minor a figure he may be in any given story, playing Winston Churchill is both a thrill and a challenge for any actor. Timothy Spall appears as Churchill in only a handful of scenes in The King’s Speech (2010), encouraging Colin Firth’s King George at the start of World War II, but he had to dig into the role. “You get to be asked to play him and you have to do your work,” Spall told The A.V. Club. “When you’re asked to play massively important historical characters, even though it was as a sort of adjunct, a cameo part, you have to pay respect. So I enjoyed the research.” Spall went on to play Churchill once more, making a surprise appearance as the character in the memorable closing ceremonies of the 2012 London Olympics. Hollywood seems to have decided that Churchill is best viewed under the microscope of individual historical moments of high stress, as a way of examining his character, his intellect and his soul. It can be the approach of World War II in The Gathering Storm, the life-or-death moment of Dunkirk in Darkest Hour or Churchill’s second-guessing about the D-Day invasion in Churchill. Into the Storm, the 2009 HBO sequel to The Gathering Storm, starred Brendan Gleeson as Churchill and covered everything from Dunkirk through Churchill’s 1945 reelection loss, after saving the country and winning the war. Michael Gambon played the character in Churchill’s Secret (2016), a film that illustrated the efforts to hide the fact that Churchill suffered a serious stroke in 1953, in the midst of his second term as prime minister. Most of the films show some aspects of Churchill’s remarkable life, but the best of them—including Darkest Hour—examine his courage under fire, in the face of stiff opposition from his own colleagues. Darkest Hour reveals a mind capable of running a government while managing a war that presented a threat to England’s continued existence, even as he wrote and delivered some of the most stirring speeches ever made by a politician. The lure for an actor is irresistible: to capture Churchill at a particularly charged moment, dealing with events that changed the course of history, even while revealing his deeply complex humanity. Having first resisted and then given himself over to Winston Churchill on a two-year-plus journey to the Oscar (“Winston came for me,” he said), Oldman admits that he retains a lasting fascination with the character. Joe Manganiello made his mark by sculpting his body, but the cigar-loving actor has dreams of succeeding on the other side of the camera.